These fine ladies make me smile! 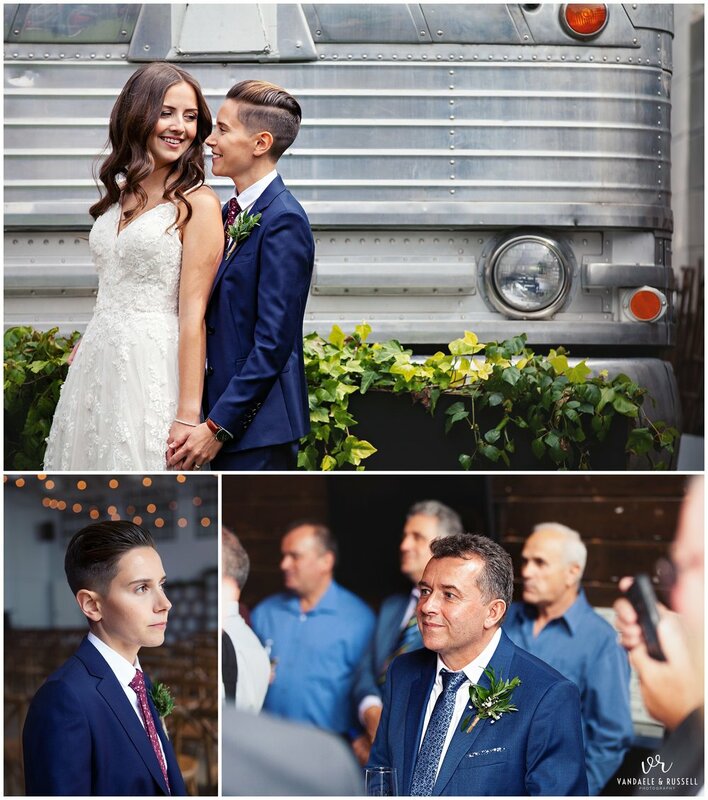 From the day we met over coffee at William’s in Kitchener to chat about their dream wedding – to their engagement shoot in downtown Dundas – and now to their epically wonderful, overflowing with love, thoughtfulness, laughter (and some tears)…I keep falling more in love with Dasa & Kathryn! First, I have to mention how perfectly planned the entire day was! 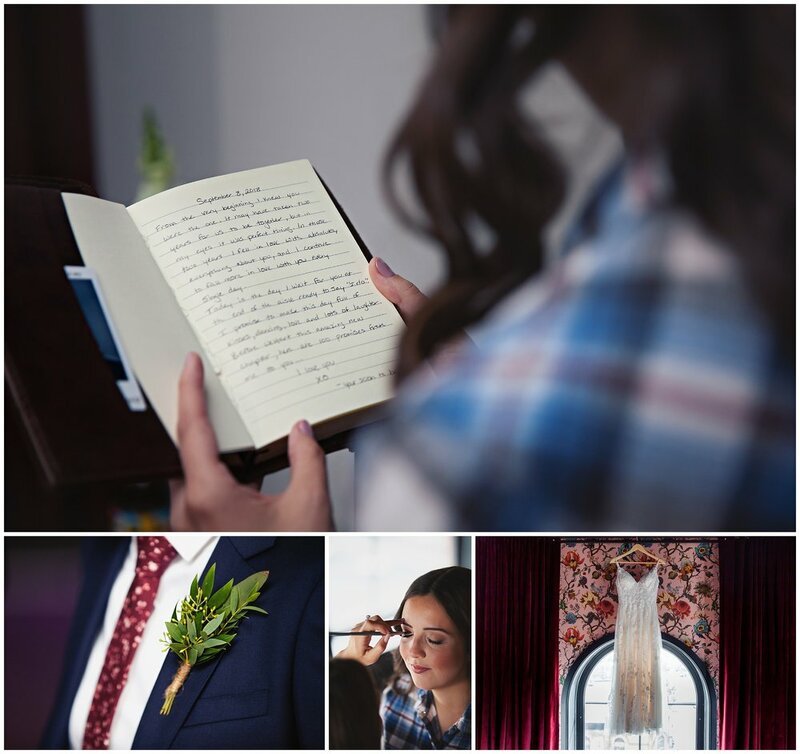 From their (magically coordinating) hotel room at the beautiful, boutique Broadview Hotel (which they shared…and managed to NOT see each other at all while getting ready! ), to the ultra modern-meets-vintage/industrial venue of Airship37 on the edge of Toronto’s Historic Distillery District – everything was basically within walking distance all day! Start scrolling…let the adventure begin! So…Dasa did ALL the graphic design and artwork for the entire wedding – from the invites to the labels, to the menus, to the signage. She isn’t just gorgeous, she’s also super talented! I mean…c’mon. Seriously. How GORGEOUS is Dasa? And that room at The Broadview Hotel isn’t too shabby, either! 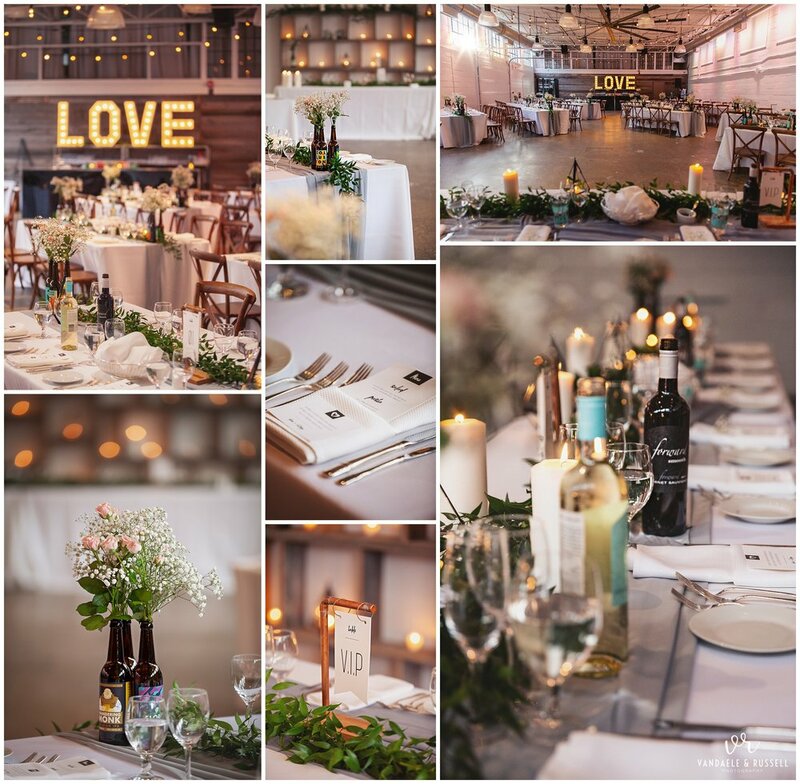 I’m such a sucker for a “First Look”…and the sheet metal backdrop and natural light at Airship37 also makes me really happy! 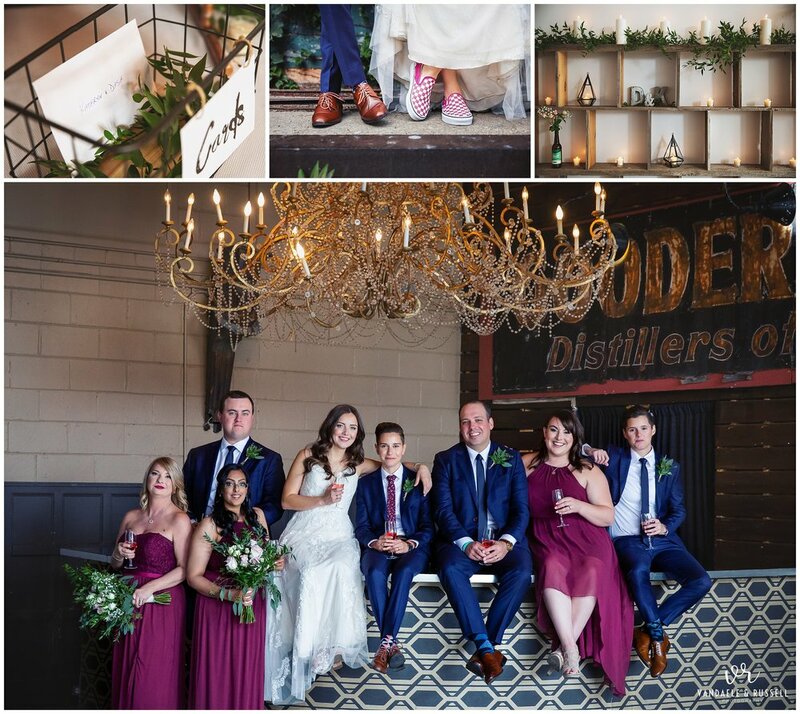 After family photos, we strolled around the corner to the Historic Distillery District for photos of their wedding party, and Kathryn & Dasa! It was surprisingly NOT as busy as I’m used to, which was a super pleasant surprise (the day seriously just kept getting BETTER AND BETTER). Can we talk about this chandelier at Airship37? Actually…I don’t have words. Just look at it. #Swoon. So this was a total highlight of the day for me! 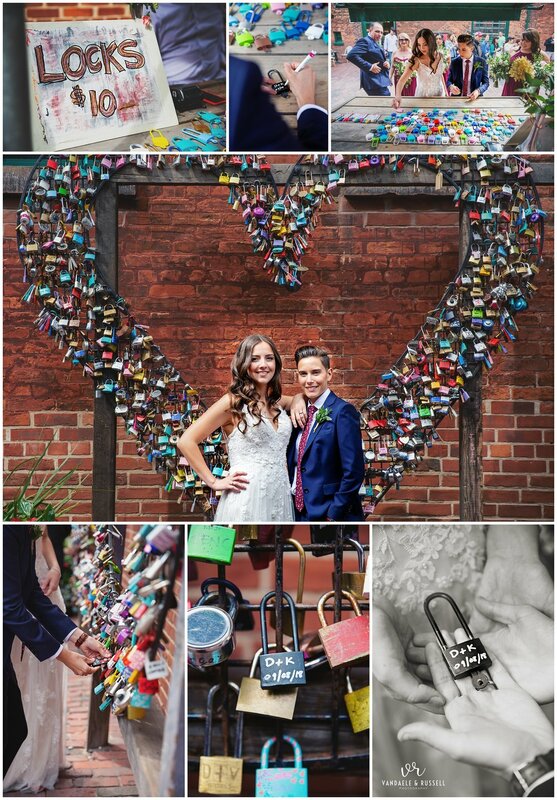 Surprise lock purchase in the market, with their initials and wedding date written on it, and added to the super fantastic Love Locks art installation! I love a little (or a lot) of colour! The contrast between the graffiti and the brick of the Distillery, the graphic art of the Hilroy billboard and the glam of the chandelier and mirrored hallway at Airship37…it gets my inner artist all excited! The massive LOVE Marquee lights were perfectly placed…as you’ll see – they not only lit up the bar during the reception, but created a gorgeous backdrop for walking down the aisle, and later on for dance photos! So…we stopped traffic. Seriously. But it was SO WORTH IT. Luckily, Parliament Street wasn’t too hopping at that time of night, but it was hopping enough to get a few horns blared at us (but again…it was worth it). And of course I needed more “night photos” by that sweet chandelier! All the pastries were provided by a friend of the family – I know, right? They look like art! Cake was provided by Molly’s Cake. 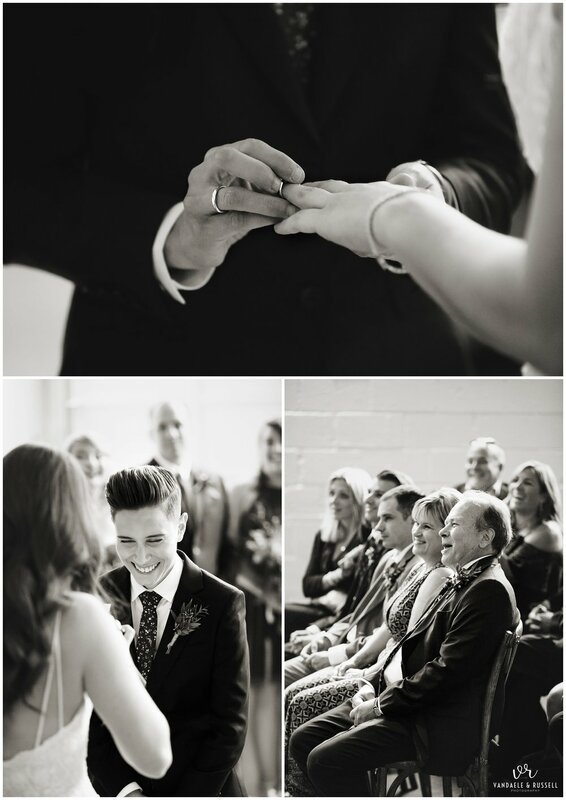 The paperwork was signed and official before the girls even walked down the aisle! Again – super clever planning, to have the legal stuff signed and complete so the ceremony could flow naturally without pause. Loved this little flip in the typical schedule! Needless to say, they were a little happy to FINALLY be married! And I admit, I was, too! So, here’s where Kathryn & Dasa’s clever planning comes in once again – all the speeches were done casually during cocktail hour – they were informal but full of heart and emotion, and their MC Lindsay (who is AWESOME and introduced K&D to our work, and booked us for her own wedding, too!) kept things flowing with a LOT of laughs. Once everyone entered for the reception – it was mingling and dancing, eating and drinking, and no interruptions with speeches! Brilliant! I cried. A lot. Kathryn’s Father/Daughter dance was an audience-wide tear jerker (and I did my best to shoot through my own!) as they danced to “I Hope You Dance” by Lee Ann Womack, as a tribute to Kathryn’s Mom. Ugh…I’m getting weepy all over again remembering it. It was truly beautiful, especially when the rest of the family joined them to finish the song. The gorgeous lyric board was made by the über talented (and former bride of ours!) Always, by Amber. Check out her site here! And that’s a wrap! I think I left just as the party was REALLY getting started (I’ve heard a few stories of the festivities that ensued afterwards haha!). I couldn’t be thrilled to have spent the day with these two and their closest friends and family, who I like to call friends and family now, too! Thank you so much to both of you Dasa & Kathryn, and I wish you all the endless happily ever afters you both deserve! 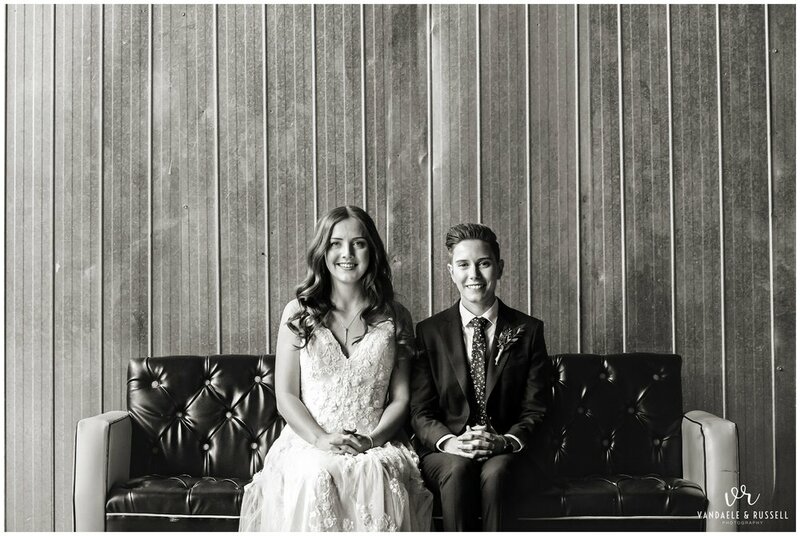 xoxo S.
And some lovely words from the brides themselves!